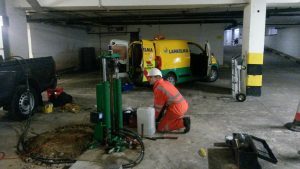 The combination of our lubricating module and CPT rams proved invaluable on a basement car park investigation in central London in October. We were working for Geotechnical and Environmental Associates (GEA) and carried out a single CPT to 26m, using our lubrication module to help the cone penetrate the underlying London Clay. The team then carried out six pressuremeter tests to 20m the following day. The lubricating module uses water to form a lubricating layer to reduce the friction between the rods and the ground. The system has proved particularly effective in London Clay, where it has enabled testing to depths of more than 40m. The design of the module means the water is distributed behind the cone and therefore has no effect on cone readings or CPT data quality. “Typically, maximum penetration depth would be between 18-20m, with a push force of 18t, but using the lubricating module we have reached depths of 30m with just 5t of push force,” Joe said. Matthew Penfold at GEA added: “The preliminary outputs from the CPTs were extremely useful in providing an indication of the likely depth of the base of the London Clay and the nature of the underlying Lambeth Group, which were used to help guide our subsequent intrusive works.